A New Mexico mountain resort recently unveiled their new fitness complex which featured a large indoor swimming pool and 32 person spa. Built on the side of a mountain, on side of the spa structure sits on top of approximately 12.0’ of fill material. When the spa and portions of the deck began to show telltale signs of settlement, the spa was drained and taken out of service, and an investigation was conducted. This investigation revealed a large plumbing leak which had occurred under the pool/spa deck, causing compaction and consolidation of the supporting fill materials. 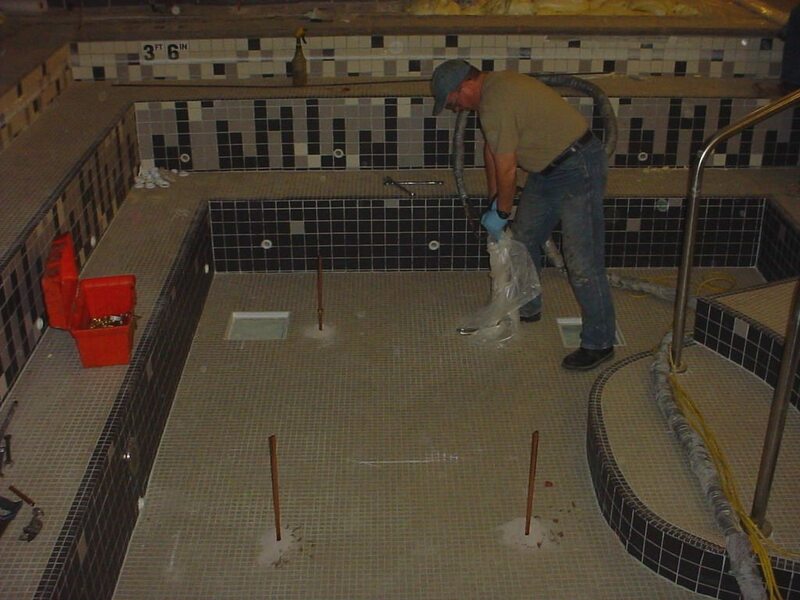 The general contractor on the job broke out a section of the pool deck to make the plumbing repair, and then turned to URETEK ICR for the remediation of the settlement issues. Management was pleased that the process meant no disruption for their guests. URETEK’s solution was less than 20% of the cost of replacement of the structure. URETEK ICR representative Scott Turnage traveled to the resort in order to assess the evidence of settlement, review the forensic geotechnical report, and determine the approximate size of the voids under the deck. This examination revealed that an approximately 1,200 square foot portion of the deck had settled up to 1.0”, resulting in concrete cracks and gaps below the walls, with voids of up to 24.0” under certain portions of the stamped, concrete surface. The spa structure itself has also settled, evidenced by cracking in the sidewalls, below the coping. URETEK ICR proposed a comprehensive solution using The URETEK Method® to void fill under the deck and lift it back to its proper position, and utilization of theURETEK Deep Injection® Process to inject at depth under the spa for void filling and stabilization. Upon acceptance of the proposal by the general contractor (and a change order to do additional areas), URETEK mobilized at the job site. Void filling beneath the deck was accomplished first, along with lifting of the deck where needed. URETEK then turned their attention to solving the deeper problems, with utilization of the patented URETEK Deep Injection® Process. Soil borings indicated voids were present at depth of nearly 11.0’, surrounded by soft soils, so technicians drilled to that level, then inserted copper tubing to the same depth. As URETEK 486 material was injected, it rapidly expanded filling voids and, always following the “path of least resistance,” fractured and squeezed the loose soils. 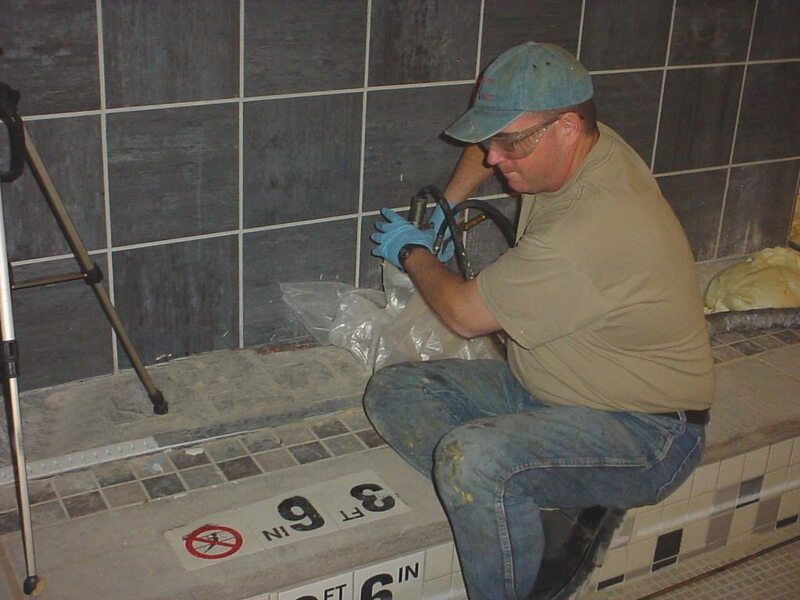 This process was continued until resistance of the soil was detected at the surface, by a “bump” on the laser detector, insuring that the soils were sufficiently densified to support the load of the water filled spa. The entire job was completed within two days, while resort guests enjoyed the pool a mere 25 feet away. Resort management was pleased that the process meant no disruption in services for their guests, and the general contractor was pleased at the short timeframe for the project and the cost (less than 20% of the cost of replacement of the structure).